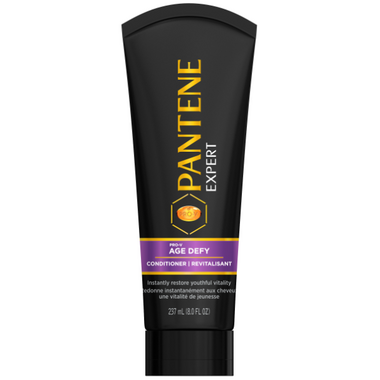 Defy the signs of time with Pantene Expert Pro-V Age Defy Conditioner. Featuring one of the most concentrated Pro-V formulas, it instantly restores youthful vitality to your hair for age-defying results. The exclusive Age Defy System with triple-blend complex was developed with help from the experts at Olay to help fight the seven signs of aging hair – breakage, split ends, frizz, unruly grays, lackluster color, thin look, and dryness – for truly amazing results. For best results, trust your hair to the experts and use with Pantene Expert Pro-V Age Defy Shampoo. Directions: Massage into wet hair after shampooing, comb through with fingers, paying particular attention to the ends. Rinse thoroughly. Ingredients: Water/Eau, Stearyl Alcohol, Silicone Quaternium-26, Behentrimonium Chloride, Cetyl Alcohol, Fragrance/Parfum, Benzyl Alcohol, Disodium Edta, Citric Acid, Panthenol, Panthenyl Ethyl Ether, Histidine, Lysine Hcl, Methyl Tyrosinate Hcl, Niacinamide, Caffeine, Sodium Hydroxide, Trisodium Ethylenediamine Disuccinate, Yellow 5, Methylchloroisothiazolinone, Red 33, Methylisothiazolinone, Blue 1.